HP has added flesh to the bones of its multi-million dollar partnership with Microsoft to combine the tech giants' hardware and software. PALO ALTO, Calif. ( TheStreet) -- In an attempt to gain share from IBM ( IBM - Get Report), Hewlett-Packard ( HPQ - Get Report) has added flesh to the bones of its multi-million dollar partnership with Microsoft ( MSFT - Get Report) to combine the tech giants' hardware and software offerings. IBM, which reported stellar fourth-quarter results after market close on Tuesday, is a major player in data center hardware, where it locks horns with HP. IBM also describes itself as the world's second-largest software vendor by revenue. HP and Microsoft have added flesh to the bones of their hardware/software partnership. For its fourth quarter, IBM reported that its software business grew 11% year-over-year, while the tech giant's systems and technology group saw a 21% sales hike. Last year, then-HP CEO Mark Hurd and his Microsoft counterpart Steve Ballmer announced plans to invest $250 million in technology to make it easier for customers to deploy technology in areas such as cloud computing and business applications. More recently, HP's Enterprise Storage and Servers (ESS) chief Dave Donatelli told TheStreet that the company was planning to launch pre-packaged bundles of hardware and software for supporting business apps. On Wednesday the companies took the wraps off three new products. The joint offerings include a Business Decision Appliance running Microsoft's SQL Server and SharePoint software on HP server hardware, which is aimed at companies looking to analyze their corporate data. A Business Data Warehouse Appliance was also launched. Geared towards small-to-medium sized businesses, the appliance runs SQL Server R2 Parallel Data Warehouse software on HP servers and storage. The third offering is the E5000 Messaging System, which combines Microsoft's Exchange Server 2010 and HP server, networking and BladeSystem hardware. "This will significantly help our customers to reduce complexity," said Mark Potter, HP's general manager of industry standard servers and software. "They all come factory integrated with everything that a customer needs to get them up and running." Potter also told TheStreet that HP is planning to launch an appliance specifically for processing online transactions, which will debut later this year. HP is not the only Silicon Valley firm pushing pre-packaged technology bundles into this space. Last month, Cisco ( CSCO - Get Report) joined forces with software maker BMC ( BMC in an attempt to beef up its cloud offerings, which follows a similar deal with EMC and VMware ( VMW - Get Report). Cisco was once a close partner of HP, although the two companies went their separate ways after the networking giant entered the server market in 2009. Now the firms are fierce competitors, with HP pitting its ProCurve networking gear and products from its 3Com acquisition against Cisco's switches and routers. 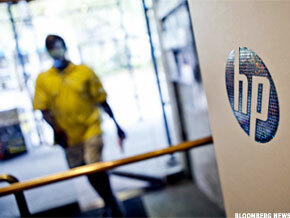 HP shares crept up or 0.17% to $46.28 in morning trading Wednesday. Microsoft's stock was down 12 cents, or 0.38%, to $28.55 as the Nasdaq slipped 0.09%.